The body of a North Atlantic right whale that was found dead off Morris Island Thursday will undergo a necropsy to determine how the animal died, officials said. A North Atlantic right whale calf found dead Thursday off Morris Island in Chatham underwent a necropsy Friday, marking the third time in less than two weeks that a whale has washed up dead in New England waters. The calf, which was still nursing, was the second to die this year, officials said. North Atlantic right whales are an endangered species and 14 calfs were born between December and February, said Tony LaCasse, spokesman for the New England Aquarium. “There’s only about 450 or so North Atlantic right whales left in the world,” said Dave Gouveia, local coordinator for the Marine Mammal and Sea Turtle Program at the National Oceanic and Atmospheric Administration. “Anytime you lose one of those animals, it’s obviously a big deal,” he said. 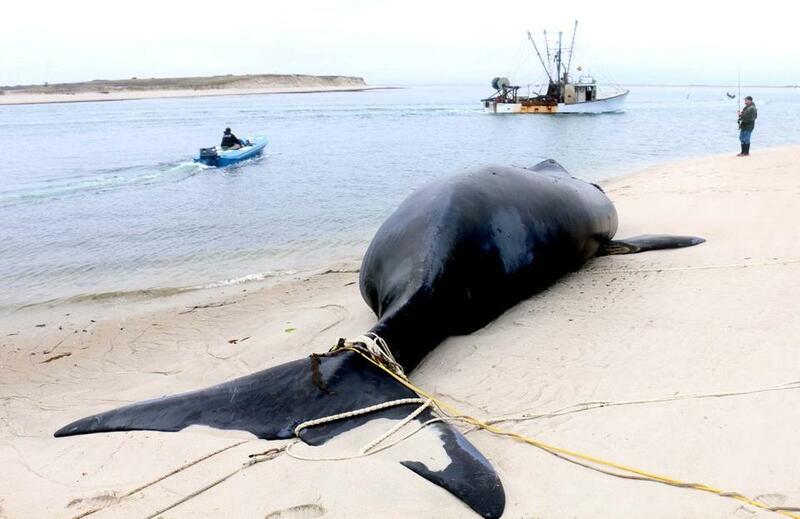 A young humpback whale washed ashore in Duxbury on April 26. The female whale was underweight and had an injury around her mouth, said LaCasse. Officials have yet to determine how she died, he said. Humpback whales are considered to be a threatened species, though their numbers are growing, officials said. On Wednesday, a minke whale was found dead in Biddeford, Maine, LaCasse said. He said officials believe the animal may have become entangled. Minke whales are not endangered, according to LaCasse. The North Atlantic right whale calf weighed about 10,000 pounds and was around 30 feet long, said Kerry Branon, spokeswoman for the International Fund for Animal Welfare. It was discovered Thursday around noon and towed to Hardings Beach in Chatham, where the necropsy was performed, officials said. The calf was found with three large wounds that appear to have been caused by a boat propeller, though officials do not know whether those injuries caused the whale’s death or occurred after the young whale died, LaCasse said. Samples taken from the calf will be examined for disease, biotoxins, and other factors to help researchers determine what killed the animal, officials said. “We’re doing our due diligence . . . to determine what was the cause of the death and to use that information to strengthen our conservation efforts to further protect the species,” Gouveia said. The calf was born in December or January off the coast of Georgia to a female right whale named Punctuation, officials said. Researchers first observed Punctuation in 1981 and since then she has given birth to eight calfs, LaCasse said. He said this is the second of Punctuation’s calves to die. She and her calf had been spotted several times this year and were most recently seen swimming together in Cape Cod Bay on April 28, researchers said. The whales are in New England waters to feed. Boaters should go slowly and look for the animals, which are sometimes difficult to see, said Jennifer Goebel, spokeswoman for NOAA’s Greater Atlantic Regional Fisheries Office. Researchers believe the other calf fatality occurred while the young whale and its mother were traveling to New England from southern birthing waters, LaCasse said. In most cases, federal and state law prohibit vessels from going within 500 yards of the animals. Gouveia said the three whale fatalities are concerning, but not anything out of the ordinary. Each death occurred in different whale species, he said. “It’s always difficult to lose one of our endangered right whales, but it’s important for us to use this tragedy as a means to stay vigilant in our efforts to recover the species,” Gouveia said.